Subtractor has been around for ever, but there are still new aspects of it’s sound that can be discovered. Using Distributor to connect 8 Subtractors into a multi-voice instrument brings some new life and a little needed fatness to the synth. The MultiSubtractor Combinator is an example of a way to maximize the Combinator mapping space and CV device control for a large multi-voice synthesizer based on Distributor. The details of the Combinator and some tricks for using it are given in this tutorial. First of all, why bother with multiple voices? The answer for many is to achieve the fatness and character of an analog or acoustic instrument. And for others it could be exploring interesting new combinations of sounds. If you’re on board with multiple voices we can proceed to the explanation. 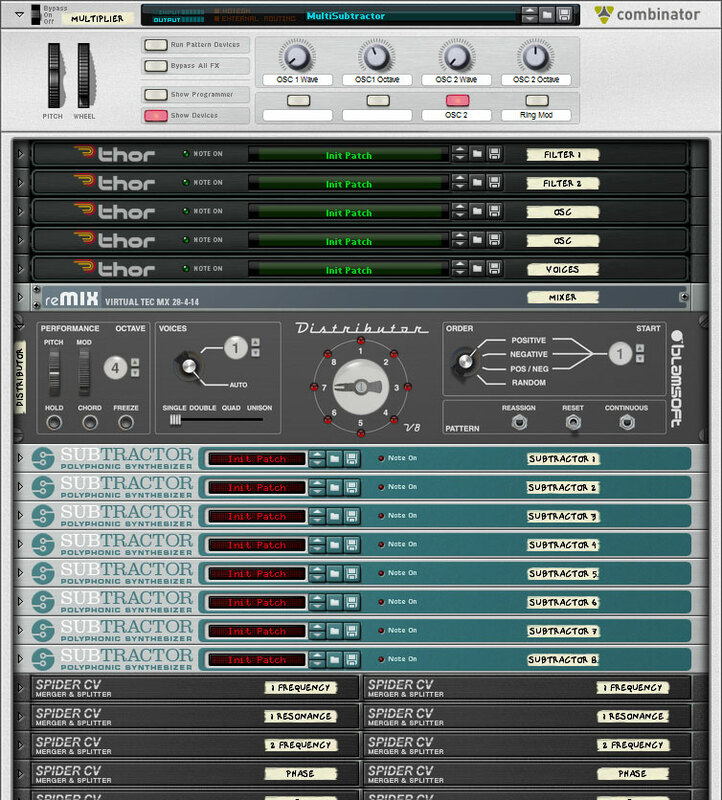 The Combinator consists of 5 Thors, used for their modifier knobs, a mixer to mix the voices, a Distributor to process MIDI, 8 Subtractors for sound generation, and several Spider CVs for routing help. Many of Subtractor’s common controls are either mapped to the Combinator controls or routed to a Thor control knob by CV. There is still room to add diversity even to these controls as will be explained later, but for now you can think of them as common to all voices. On the Combinator knobs, the oscillator waveform and ocatve can be selected. On the Combinator buttons, Oscillator 2 can be enabled and ring modulation can be enabled. 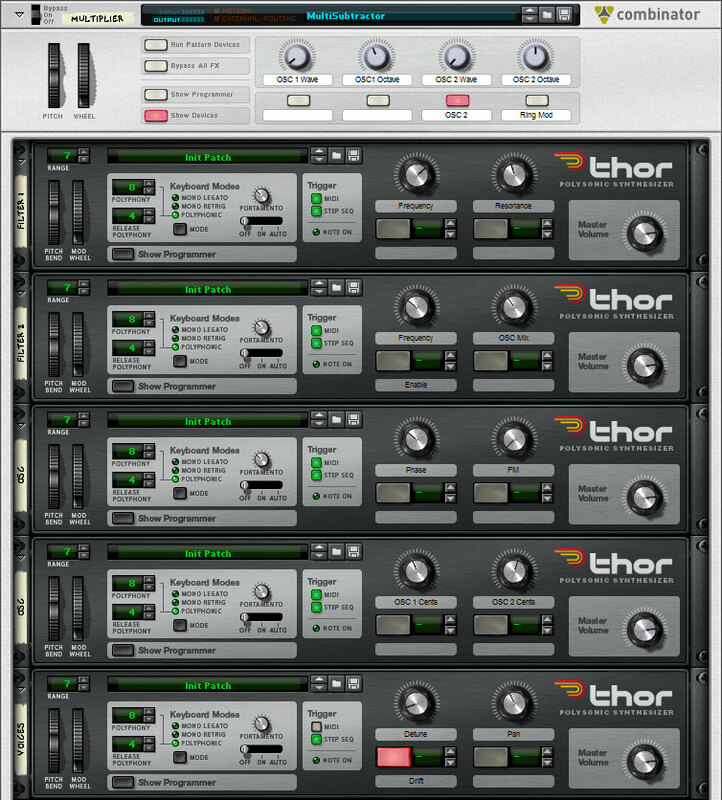 The first Thor controls Filter 1 Frequency and Resonance. 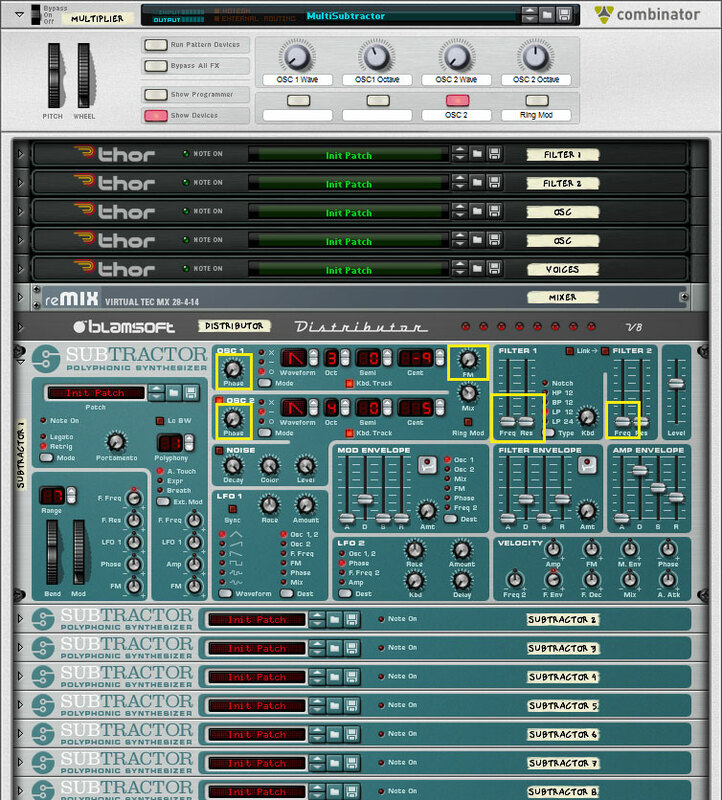 The second Thor controls Filter 2 Frequency and it’s enable switch, and also controls the Oscillator mix. The third and fourth Thor control oscillator paramaters Phase, FM, Oscillator 1 Fine Tune, and Oscillator 2 Fine Tune. The fifth Thor has global parameters Detune, Drift, and Pan which will be explained in more detail. 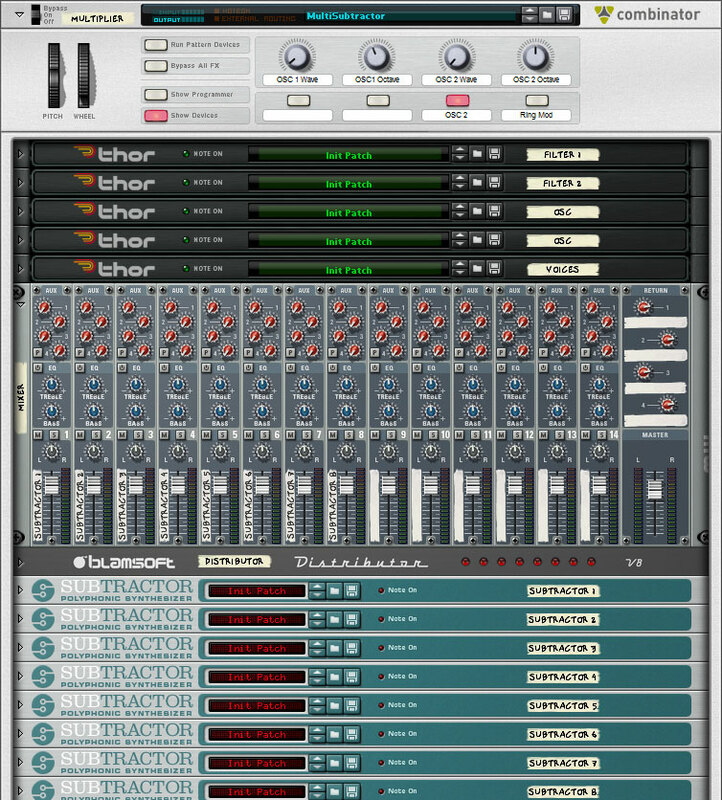 The mixer mixes the 8 voice channels. One benefit of separate voices is that they can be panned individually. Panning voices is a feature of some nice analog synthesizers. The Pan knob on the Thor pans each voice slightly differently away from center as knob is turned up. This feature can be found on the DSI Prophet 08 synth. Alternatively, you can turn the Pan knob down and pan each voice in the mixer. The Distributor handles all MIDI control in the Combinator and routes the Gate, Note, Pitch Wheel, and Mod Wheel to the Subtractors over CV. Because some of the commons controls are using CV, the knobs on the Subtractor will have an effect. In general, you should turn these knobs down on the Subtractors. But by setting these knobs differently, it is possible to add diversity and still have common control. Setting these controls slightly above zero would add some interest. Other Subtractor controls were not chosen for the Combinator but they could be remapped into the Combinator controls if desired. To add diversity to a Combinator control you can modify the range for one of the Subtractors differently than the others. One useful example may be to adjust the Oscillator Fine Tune range so that each oscillator in each voice is tuned differently. In the current Configuration each voice is tuned differently but not each oscillator. On that note, tuning is a very important aspect of making a fat sounding instrument. 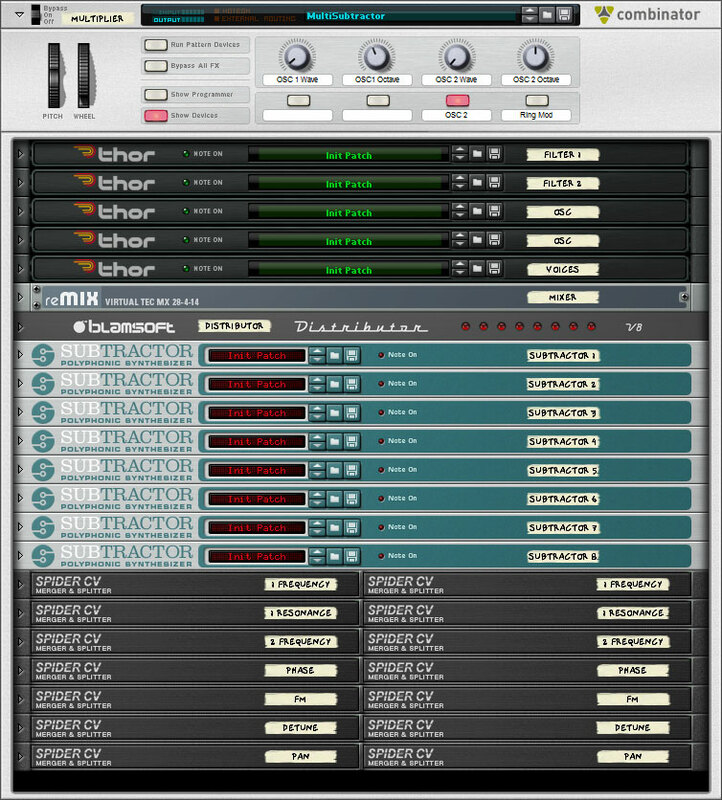 There is a Detune knob and a Drift Enable for the Combinator in the fifth Thor. The Detune knob adjusts the tuning of each voice slightly differently as it is turned up. The Drift setting uses a smooth random LFO at a slow rate to emulate the drift of analog oscillators. If you want to try out a sound on a single voice, simply turn the voices selector to 1 voice. Then switch it back to auto to use all of the voices. Now you know what’s in the Combinator and how to use it. If you find that other mappings or CV routings are useful, feel free to post in the comments section below. Sorry but I don’t understand how to connect the eight Subtractors and the five Thor? Are the Subtractor instance for the eight Distributor’s CV Out ? The Combinator can be downloaded at the top of the page. The cables have already been routed. I tried out the MultiSubtractor. I may have missed something, but I must admit that I’m a little surprised this wasn’t designed with about four to six times the number of voices. What if you want a fat, multi-voiced, well-distributed sound while playing one note as well as when playing chords? Chords sound well-distributed when in Single mode. But for one note, it’s either a more isolated sound or a requires a more multi-voiced mode per simultaneous note, which uses up more of the 8 available voices, restricting how many notes can be played at once. So wouldn’t it take 48 voices if you wanted to play a part with a consistent multi-voiced sound when you’re playing one note as well as when you’re playing 6-note chords? Otherwise wouldn’t you need multiple instances of the whole setup, forcing you to put different notes of the chords in the different tracks in the sequencer? It’s not very convenient to play different notes of the same keyboard part in different tracks. The only other way to do it would seem to be to put multiple instances of the instrument in a combinator, but it already uses a combinator, and you can’t put a combinator in a combinator. So am I missing something? That is, I’m suprised the device (not this particular combinator) wasn’t designed with at least 48 voices instead of 8. You are limited to 8 voices but the voices are not limited to a single instrument, they can be more than a single Subtractor. You could split the CV data going to each Subtractor and route it to more layered instruments. Or instead of having the Distributor in a Combinator you could control 8 Combinators by their sequencer control and CV ins. Each Combinator could have a number of layered instruments. You can make layered instruments, but you are limited to 8 voices of polyphony. If you want to use Distributor as a kind of splitter you can chain them. You still have 8 voices of polyphony at the top but you can have many voices connected in unison on each lower level Distributor. I finally got around to what you mentioned on February 10 about chaining Distributors. I created a multi-voiced polysynth using 1 main controller Distributor randomly using 8 single voices connected to 8 other Distributors accessing a total of 64 monophonic synths consisting of 8 identical sets of 8 synths that each use different slight variations to 7 synth parameters, to allow random variation for both of 2 voices sounding for each note in chords of up to eight notes. Total audio and CV cables for the one instrument: 450. Obviously there are easier ways to create a similar effect, but I wanted to see what it would involve with monosynths and chained Distributors, and to see what it would be like to control every last detail of the random variations. Good fun. I got the distributor mainly to use it with Microtune (by Ochen K) which detunes individual notes by applying pitch bend and therefore once it’s in effect, it won’t be possible to play chords with it so the distributor is a perfect solution to this. However, when I set it up the distributor works normally as it should except that the keyboard notes get all altered and not just the notes I choose to detune. Somehow the distributor is dividing the octaves in strange intervals. I tried all routing possibilities and I’m always getting the same problem. Any help would be appreciated. The octave setting on Distributor affects the note output but otherwise it should be the same as what is played on the keyboard. Please contact info@blamsoft.com to further discuss the issue.